The TCGS library includes over 3,000 books, 450 periodicals, 200 CDs, over 10,000 items on microfilm or microfiche. Books, microfilm & microfiche are accessed using the catalog on FamilySearch.org . 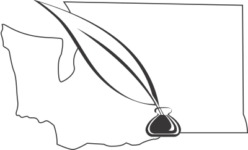 Choose “Richland Washington Family History Center” from the “Search these Family History Centers”. Then search for the location, keyword, etc. that you desire. The Tri-City Herald, our local newspaper, for Jan 1970-Jun 2001 is also available on microfilm. This set is not included in the FamilySearch.org catalog. Periodicals. The library staff is now working on cataloging our periodicals. For now the 2014 list provides access. Additional more recent issues may also be in the library. The description of our books through Jan 2014 includes abstracts describing the books. These often include surnames or counties covered. While the book number are incorrect the abstracts are still useful. Use the catalog access above. If you find something of interest, our TCGS researchers will search these resources for you for a fee. See our Research page for details. 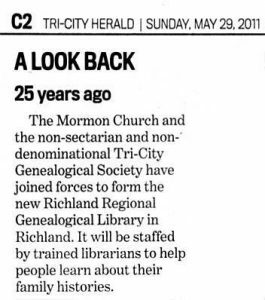 Our Library is housed at the Richland Family History Center. Address: 1314 Goethals Ave, Richland WA, directly behind the Mormon church at 1314 Jadwin Ave. Hours: Mon, Fri, Sat 9am – 5pm and Tues, Wed, Thur 9am – 9pm. Building Map: shows collection locations. Online State Resources for Genealogy compiled by Michael Hait. CD 950.
see Webinars for educational CDs.